The book also covers identification methods of new enzymes and the optimization of known ones, as well as the regulatory aspects for their use in industrial applications. Up to date and wide in scope, this is a chance for non-specialists to acquaint themselves with this rapidly growing field. Wolfgang Aehle is a senior scientist for Protein Engineering at Genencor International, a Danisco Company. After finishing his Ph.D. in Organic Chemistry, he discovered the beauty and excitement of working with protein 3D-structures during his postdoc period on molecular modeling of Subtilisin at the GBF in Braunschweig. Aehle further pursued his career in industry as a protein engineer. He has focused his work on a significant number of industrial enzymes, which are subject of this book. His research interest is driven by the wish to understand the enzyme function in the various industrial applications, whose physical conditions are far from the original environment of the enzymes. The main goal of his work is to improve enzyme function in the industrial environment. His work is documented in numerous scientific publications and patent applications. "The quality ... is so great that there is no hesitation in recommending it as ideal reading for any student requiring an introduction to enzymes. ... "Enzymes in Industry" should command a place in any library, industrial or academic, where it will be frequently used." 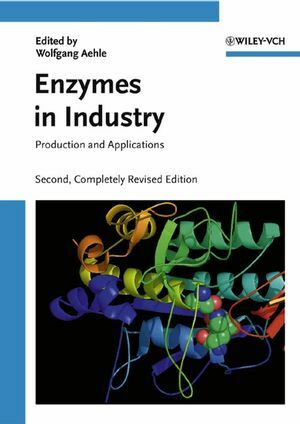 "Enzymes in Industry" is an excellent introduction into the field of applied enzymology for the reader who is not familar with the subject. ... offers a broad overview of the use of enzymes in industrial applications. It is up-to-date and remarkable easy to read, despite the fact that almost 50 different authors contributed. The scientist involved in enzyme work should have this book in his or her library. But it will also be of great value to the marketing expert interested in the present use of enzymes and their future in food and nonfood applications." "This book should be available to all of those working with, or aspiring to work with, enzymes. In particular academics should use this volume as a source book to ensure that their "new" projects will not "reinvent the wheel"."